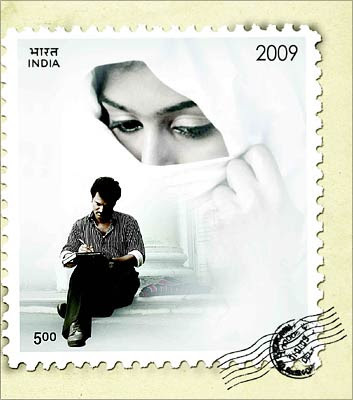 Cheran's Pokkisham is all about love letters. One fine morning, a son opens up his father's trunk suitcase and reads the letters that his father has (preserved - got the title !!!) received from his love.Lenin (Cheran) is a marine engineer working at Calcutta (in 1970s, Yeah this one’s a period flick) and Nadheera (Padmapriya) is a Tamil literature student at Nagapattinam.Love blossoms and they reciprocate and express it via letters (Which is the only mode of communication in 70s...Trunk call facilities were in their infancy in India,then). The movie is more like a novel read aloud... after all it is about love letters read aloud. A few twists, turns, communalism, Sentiments and I am not going to spoil the fun...Give it a watch and enjoy.I just wish to comment on a few aspects of the movie. Calcutta – Calcutta always has an artistic and literary sense attached to it. May be because,it has been the home of a lot of artists and artistes like Rabindranath Tagore, SD Burman, Satyajit Ray, Mrinal Sen etc.I don’t know if its universal but a mere mention of this name brings in me the beautiful images of Howrah bridge and Goddess Durga(yellow faced deity). Pokkisham has tried to emulate Calcutta in 70s with the railway trams, hand-pulled rickshaws, Howrah bridge,Victoria Memorial,Durga pooja festive atmosphere and all. Period Settings – Bullock carts,old-styled motor cycles and the Government bus etc are a few things I noted at the first viewing, with regards to the period settings.One more thing that captivated me is the look of the post box.The post boxes of the olden days are a bit odd in structure and guess what...The IISc (Indian Institute of Science,Bangalore) campus still has one of the post boxes (near the main building) of this style & looks. Communism – Speak of Bengal and Communism naturally walks in. There has been a lot of mention of the communism and its principles through out. The name of the protagonist-Lenin, discussion of communism by the lead actors - Lenin and Nadheera, Lenin’s father claims that he is a communist, Ilavarasu who appears as Cheran’s neighbour in the movie discusses communism. It gives out a feeling that Cheran must be an admirer of communist principles. Also, 70s are a period of political unrest followed by restructuring in India and Bengal especially. Emergency, Jayaprakash Narayan, Jyothi Basu as CM in Bengal - all happened in 70s.That might also be one of the reasons for the underlining of communism throughout - Personal opinion. Wavelength match – Imagine you get a soulmate who has a wide panoramic view of the world around. Be it literature, arts, politics, views on society,views on communalism and communism, ideas on the role of a woman in a modern society and lots more.Fit them all in a beautiful damsel and you get Nadheera. Precisely, that’s how her character is shaped in the film.Lenin and Nadheera discuss a lot of these stuff in the movie and you envy their chemistry.This is what I call the “wavelength match”. Dialogues – Its poetry in simple terms. Lots of refreshing new dialogues and fresh ideas. Of course,the subject of the movie – love letters, offers a lot of scope and Cheran enthralls us with an array of wonderful poetry.Love beautiful romantic verses in tamil ?, then you have got to love the dialogues of this movie. Songs & Musical score – Songs in the movie never distract you from the course and they just gel with the storyline - they never look like inserted-upons. Introduction song, bar item song, unnecessary duets at foreign locations are something you won’t see in a Cheran film. One of the song situation in the movie is, the protagonist is travelling in a bus or train - his anxiety to meet his love is conveyed by the song. This way,they never looked misplaced.But there were no catchy melodies that will find your memory’s cache.And the background score is less than impressive. Photography – The cinematography is very impressive. The song sequences picturise a lot of Rains and vivid images.I just felt like it’s raining outside my house.It looks that natural and Beautiful !!! Cheran ~ Miscast ? – Cheran seemed to be a miscast for this wonderful and poetic script. He tries to portray a young and dynamic youth in his early twenties – but this doesn’t seem to work all fine with his aged persona.I know that no prominent actor of the tamil cinema are willing to do Cheran’s scripts but he can always find a new face and introduce him. And Padmapriya looks fine as a muslim girl.But after watching Maniratnam’s Bombay, whenever I see a muslim girl role in any movie – I always felt Manisha Koirala, the perfect choice – Personal view anyways. Length of the film – The movie runs more than 160 minutes and rests on dialogues and poetic verses.No doubt, It is intense and gripping but I see no reason an ordinary filmgoer would be interested in this flick. Cheran hit that magical dart in his Autograph (2004) but seemed to have lost touch now. He has to be a bit-more novel to this next gen audience,I feel. Cheran’s films always have some value attached to it, instead of being a regular masala heap. However the going seems tough for him with his last three films (Thavamai Thavamirundhu (2005), Mayakannadi (2007),Pokkisham (2009) ) receiving a not-so-big response. I liked two of them except Mayakannadi. But,We need directors like him to try out sensible scripts to keep our cinema alive. You're in the middle of a Bengal fetish :) What's next then - Rabindra Sangeet ! Ray's Apu trilogy movies all had a common connect-line ... "TRAIN"
After all, Its Tagore's language with which I have developed this !! !